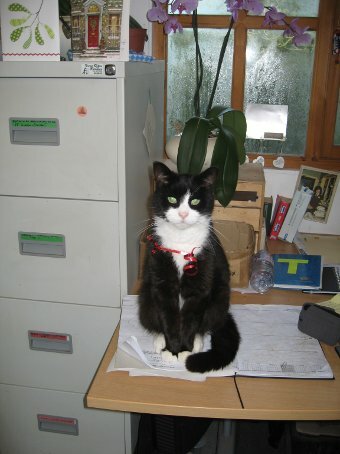 I understand that a number of our company invoices and documents have recently been "signed" by Iggy the office cat. For those of you working in lovely modern, tidy offices, I have to explain that Decorfolia is based on a small nursery in the New Forest National Park. Our office is a bright, warm and cosy cabin that we share with our resident "rodent officer", Iggy. He moved to the nursery with us from our original New Milton site and settled in very well. As we are unsure exactly how old he is the vet keeps a good eye on him, and he is on daily medication for a bit of a thyroid problem (Iggy, not the vet). 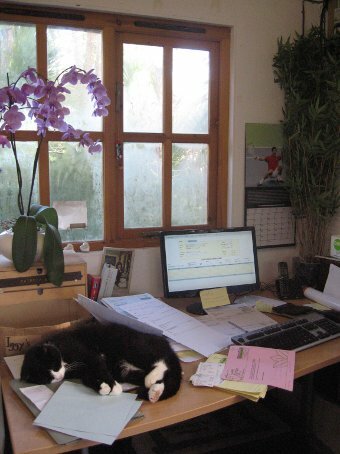 So, if you do receive some paperwork from us with a small paw print, please accept our apologies, but rest assured that your documents have been proof read and stamped by the "boss".